…Perfumes and colognes introduce a different scent into the animal’s environment, triggering natural reactions, such as marking the territory. “It really gets their senses going and they start to investigate” (source). Bear pit attractions…give tourists the opportunity to walk around the perimeter of man-made concrete pits inhabited by bears. For a small fee, the attraction supplies hunks of stale bread and sectioned apples. You stand on the edge of a pit, yell “Hey, bear!” and hurl the food down at their snouts. There are no skinny bears in bear pits. They are constantly fed – even when there are no tourists — and pass the time completely sheltered from their natural habitat. Imagine yourself abducted by aliens and kept in a big TV room for 80 years or so, with 2000 channels and all the chips ‘n’ dip you could eat. Wait — that is your natural habitat… bad analogy. I’m ashamed to admit that I was once one of those people. My love for animals was so strong that I would do anything to get close to them, even though their pain and frustration and suffering was so evident to me. Even now, as a 3-year vegan, although I won’t ever go back to a zoo or exhibit because I refuse to financially support such enterprises, sometimes I wish I could just in order to be a witness to their suffering and to educate others who attend. But if I woke up, perhaps others will, too. We need more sanctuaries, that’s for sure. Rebecca, it speaks volumes about your honesty that you’re willing to admit you were once one of those people. I’m guessing that many or most of us were. Please cut yourself some slack and rather than shame, feel proud, or empowered–whatever the right word is–that you’ve found your way to the place you’re in now. It’s a huge accomplishment to overcome a lifetime of conditioning that teaches us to disregard animals, that their lives are of no consequence. Kudos to you, me, and everyone else who has overcome that or is in the process of becoming. Thank you for this excellent piece. It leaves one in anguish. I agree that contempt is pointless (but hard to avoid). What we need are 1000 Bob Barkers to flood the mass media with well-designed ad campaigns about nonhuman suffering. On a more modest scale, we can each take every opportunity that presents itself to speak out nonjudgmentally against these and similar atrocities. The mixed review types CAN be reached with a little moral suasion. Rebecca, you comment is wonderful. Reading those comments that echo the same sentiment that “While it is a little sad, it is well worth the money.” remind me of how I know those who patronize circuses feel and think. As they pass the signs held by protesters showing whipped and chained elephants it’s a certainty that these relatively smart people understand the problems… And then once and a while they’ll even say “Yeah, it’s awful… But the kids love it so!”. I have no idea either on how to reach these thoughtless voyeurs except to take every opportunity to educate people when and where we can. After all… We all got here to a place of compassionate thinking – We have to expect and insist that others rise to the challenge as well. On a lighter note Kathleen – I just love your clever inference to the Eternity fragrance. Your mind and wit are sharp as a tack! Thank you! 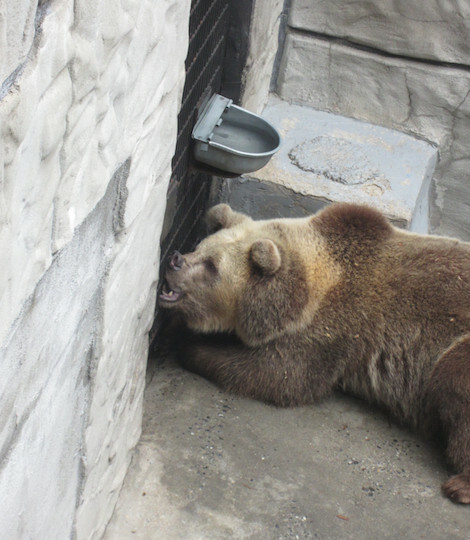 The practice of keeping bears in concrete pits seem indefensible from any point of view.